EOSex (The Exchange for EOS Community): Number One Platform for Trading Quality Digital AssetssteemCreated with Sketch. With the introduction of Blockchain and Cryptocurrency, numerous exchanges have envolved over time and more businesses are coming up with projects that involves getting their tokens listed in this cryptocurrency exchanges. It is difficult to get on exchanges and it is also very expensive just to get the tokens of the project to be listed and sometimes, this projects do not even reach their Initial Coin Offering (ICO) targets. Funds that should be used for further project development is used to pay for listing fees. Also, Crypto traders have very little options to choose from regarding the types of digital assets that is available in the cryptocurrency industry because only a few have those options. EOSex is creating a platform that will overcome all these obstacles by providing cold storage wallets where all user's data will be safe and secured. The platform also provides flexibility to users. 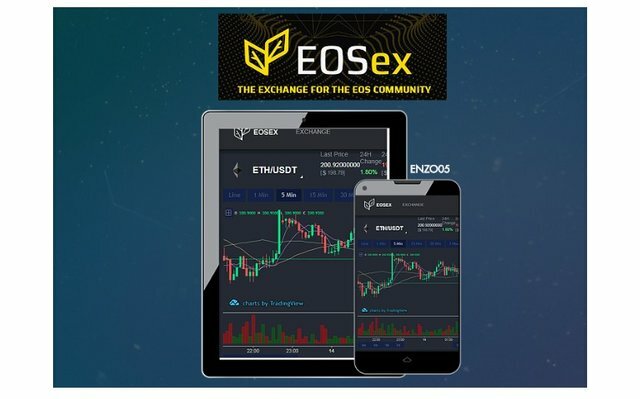 EOSex is an initial for EOS and Exchange which was incorporated by the platform in order to show their support and commitment for the EOS platform and its ecosystem. EOSex uses an advanced modelling technology in order to create a quality and high performance trading for users. The number one priority of the platform is to protect funds and data and that is why it stores its funds across cold storage and online wallets. The platform plans to offer CFD trading, digital asset spot trading and on-chain trading. It will offer exchange tokens which is called EOSex Proof (EXP) and once the tokens are issued, it will be a distributed company instead of the previous Independent blockchain entity. Being a distributed company means that it will be controlled by EXP token holders, the EOSex community and the EOSex foundation. Every EXP token holder will have a share in the profits that is generated by EOSex. One of the feature is that it has a high performance trading. The trading engine of EOSex engine has gone through a rigorous performance testing already and it has be proved that it is able to handle large trading volumes and sudden large changes in the trading volumes. The trading system makes use of a distributed technology that gives room for expansion as the trading volume increases and the processes are separated and processed independently in order to distribute the workload evenly so as to avoid lags and bottlenecks. - It has also has an efficient cloud architecture which gives great scalability. It also has high liquidity. The team of EOSex created a Liquid-Box which allows the routing of major exchanges into EOSex in order to provide a very deep liquidity for tokens that are selected to be listed on EOSex. More to that, it is very secure and stable. The priority of EOSex team is the protection of funds and data. EOSex team is experienced in building digital wallets and distributed architectures. The team ensures that funds are not stolen or lost with its in-house developed proprietary compliance system. EXP is based on and created by EOSex. It is a proof of membership in a community and is owned by the entire community with the purpose of assisting with development of the community and giving everyone a say in the development. EOSex is the best platform for trading quality digital assets because it is safe, stable, secure and transparent platform. It puts and end to problems such as difficulties faced in getting listed on exchanges, low trading volumes and lack/low options in the types of digital assets available with its unique trading platform.